After yesterday’s walk along the Llangollen Canal I feel in need of a walk up a hill. 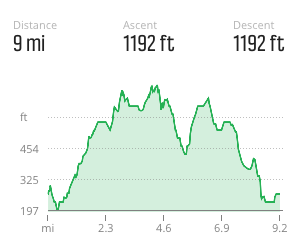 Looking at the map the nearest spot around here with a half decent climb is on the Sandstone Trail as it crosses the Peckforton Hills a few miles away. 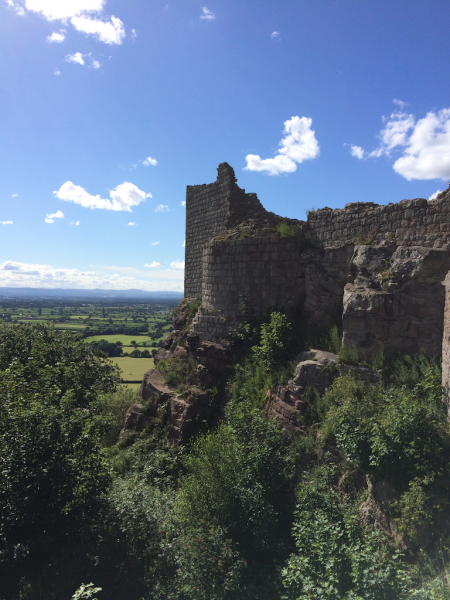 Lynnie is swayed by the promise of a visit to Beeston Castle and the possibility of a visit to the nearby Snugbury’s Ice Cream Farm. 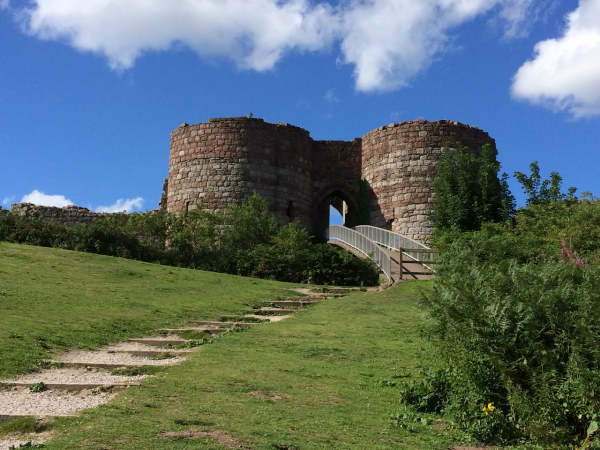 The starting point for our walk is Beeston Castle car park. 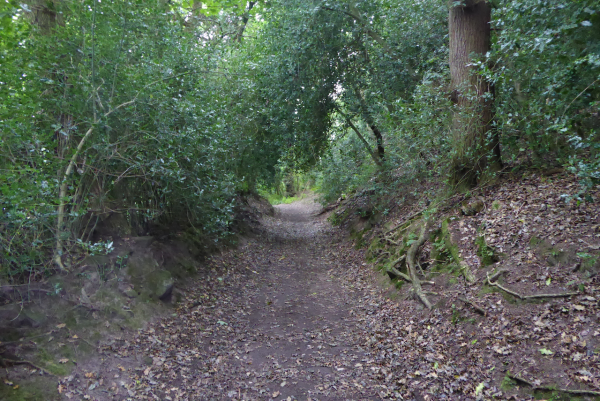 The Sandstone Trail runs past the car park so it is easy to pick up, we turn left down the lane and very shortly take the Sandstone Trail way-marker on the right, the path heads alongside the wall of the castle grounds. Soon we are in woodland following the well-defined path to a minor road that we cross to join the trail as it enters arable fields and then heads across pasture. There are bears here, but they lay quietly as we walk through them. 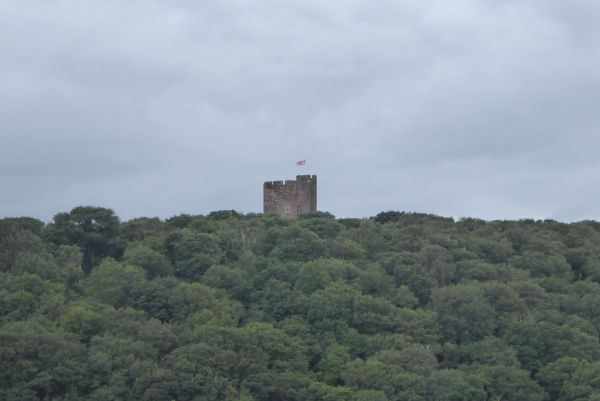 On the hill above us is Peckforton Castle. Although this castle looks medieval it was actually built in the late 1840’s for a major local landowner and Conservative Member of Parliament, John Tollemache, ownership stayed in his family until the 1980’s. For much of this time it was only used occasionally, apart from during World War II when it was used to home physically handicapped children evacuated from London, and then from 1969 to 1980 let as a private residence. It is now a hotel and wedding venue. On reaching a tarmac lane we turn right and pass a couple of cottages before turning left on the Sandstone Trail as it follows a broad track into Peckforton Woods. The forestation of these hills took place in 1922 and the area is now a Site of Special Scientific Interest, which means they are cracking woods. 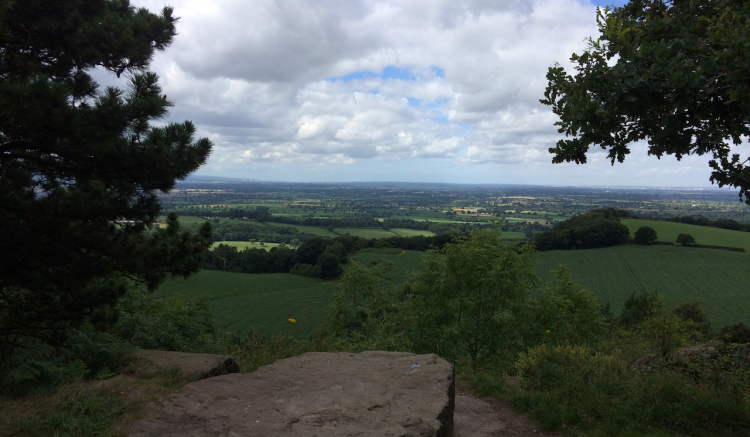 The route is straightforward, we keep following the Sandstone Trail way-markers, eventually they lead to a clearing where we get the first glimpse of the view across the Cheshire Plain, in the distance is the City of Liverpool. For a number of years I worked in Liverpool and around 2005 Lynnie and I were very close to moving to the City. I thoroughly enjoyed working there and would like to visit again just to see how it has changed. Though these days I much prefer to be out on the hills rather than in cities! Meeting a minor road we turn left and then almost immediately right to go along the edge of more fields. This is easy going, the route is clear and the paths are well managed. We reach a tarmac lane and turn left and then very quickly turn right along a track. 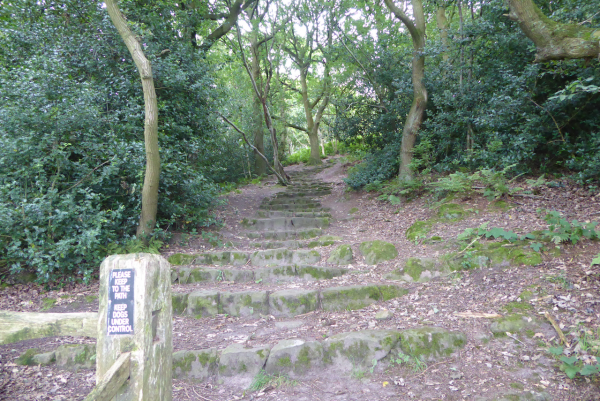 Within a short distance the sandstone trail markers direct us up steps into the woods of Bulkeley Hill. These are really stunning woods. 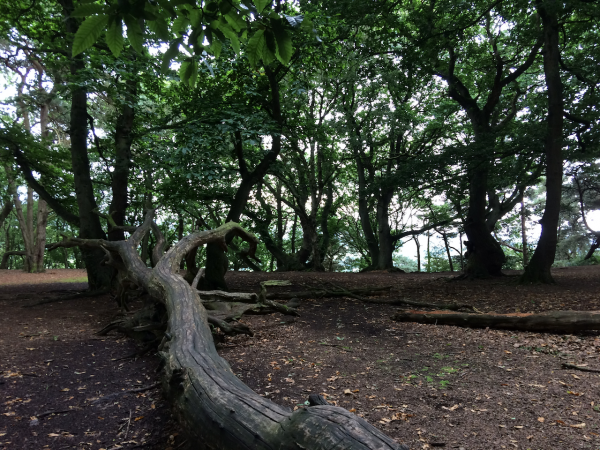 We love being in old woodland, I am sure that if these trees could talk they would tell an interesting tale. Thinking about it trees can talk, as reported by The Inkspots; “Don’t you tell it to the trees / She will tell the birds and bees / and everyone will know / Because you told the blabbering trees / Yes, you told them once before / It’s no secret anymore”. We sit down on an old tree trunk for a picnic and listen to the trees, I try hard but can’t hear any secrets! But I know a few! Whilst we picnic I look at the map and realise the contour lines are very close in these parts. With absolutely no head for heights I wait whilst Lynnie, much braver then me, wanders to the edge of the woodland. She returns to confirm my suspicion that we are on the edge of a pretty steep drop. Armed with this knowledge I keep well away from the edge. 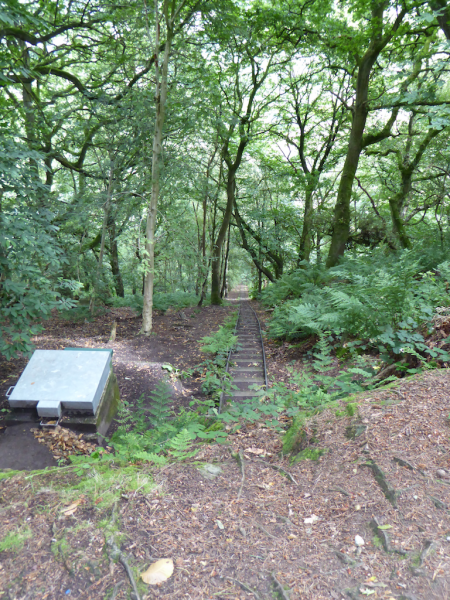 The narrow gauge track here was built in 1949 specifically to carry heavy components to the summit of the hill during the construction of a surge regulator at Peckforton Pumping Station. 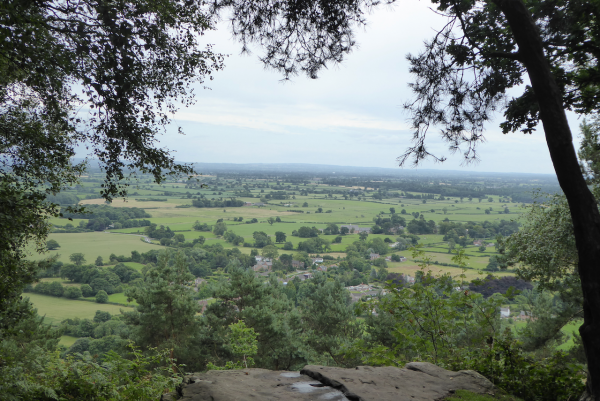 The trail leads through the trees and then crosses a field to reach a crossway of paths, we stay on the Sandstone Trail by going straight on along a track to Bickerton Hill. Soon we take a left to join a narrower path where the trail veers from the main track. 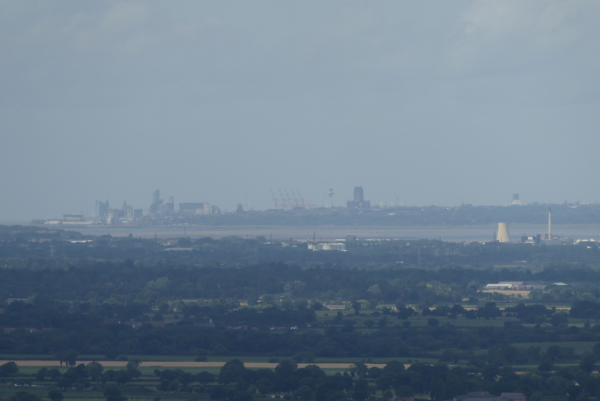 The views from here over the Cheshire plains to Liverpool are really impressive. 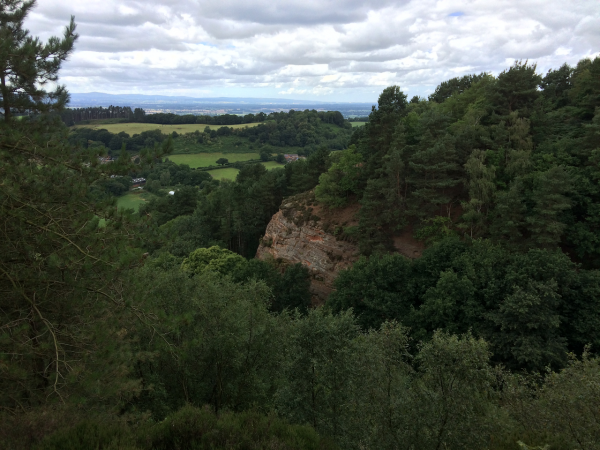 I have not looked at the map for a while, it is easy to follow the signs for the sandstone trail, so I m not too phased when I see signs warning of steep drops. There are plenty of trees around and there is no evidence of a drop that might cause me concern. 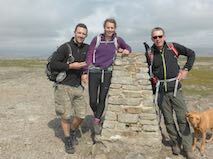 Just as we reach Raw Head there comes a short section that causes my heart to beat faster, but we are soon past and standing at the trig point quite relaxed. 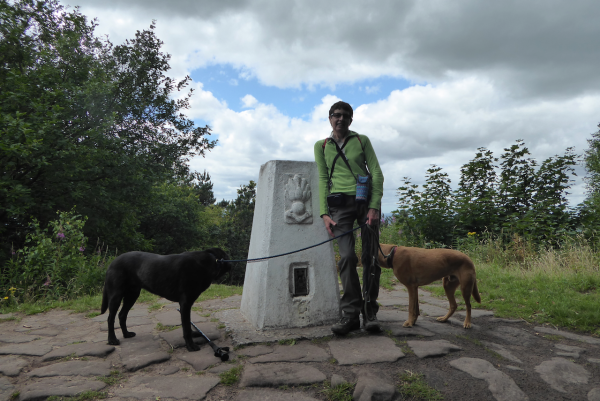 Lynnie and the boys stop for their trig point photo, the dogs seem more interested in the view. Resuming our walk we continue along a narrow path with a fence on one side, all too soon I realise that this ribbon of path is getting very close to the edge and as trees clear I get a view of the drop. I try not to freeze but it takes every ounce of determination to keep going. I feel tense and anxious and when we turn the fenced corner to enter into trees again I am breathing hard and very wobbly at the knees. Then around the corner charges a large dog followed by a family with three young children running about. 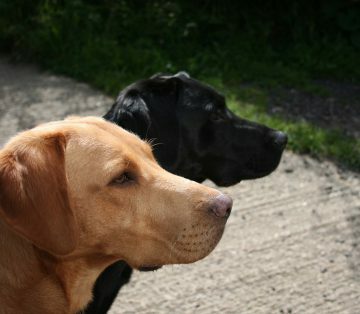 As usual both our dogs are on leads; not everyone likes dogs! I recognise the panicked command, (ignored by said dog), from the owner, clearly this dog has form and she is worried about how he will respond to us. Suddenly the dog leaps to attack Dexter and pandemonium breaks out. Dexter is the most docile dog you will ever meet and I am fuming at the way, once their dog is hauled away, that the family walk on without any apology or waiting to see if Dexter is okay. The young boy closest to the action was clearly alarmed but had obviously witnessed such scenes before. He could be heard berating his mother urging her to put the dog on a lead as she knows what it’s like. Fortunately there does not appear to be any damage; though Lynnie’s knees are now knocking as she had hold of Dexter. Dexter is clearly shaken up, he is nine and as an old boy expects a bit more respect. We are very thankful we didn’t meet them on the narrow path at the cliff edge a few yards back. I hate to think what might have happened. It is moments like this that give dog owners a bad name, and I was certainly calling them a few bad names! The path now heads further from the edge and we join a farm drive down to the A534 where we turn left and walk with care besides the main road for about quarter of a mile before turning left up Copper Mine Lane. There are remnants of the old mining industry that dates back to 1696. 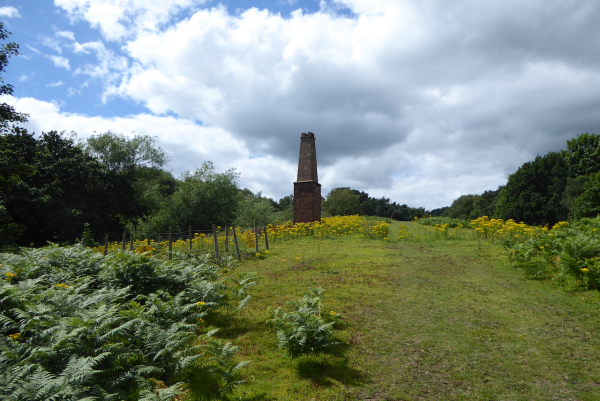 The mines closed in 1906 but the flue of the pumping engine, used to drain the mine, is still standing. 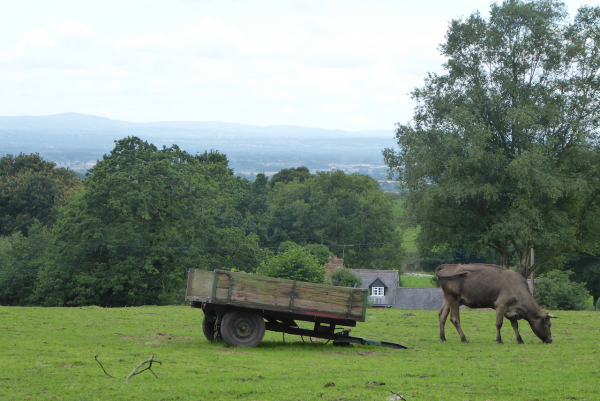 We follow the lane uphill and continue on it towards Bulkeley Hill Farm. After passing the farm we turn right at a junction of paths to head along a track skirting the trees of Buckley Hill Woods. 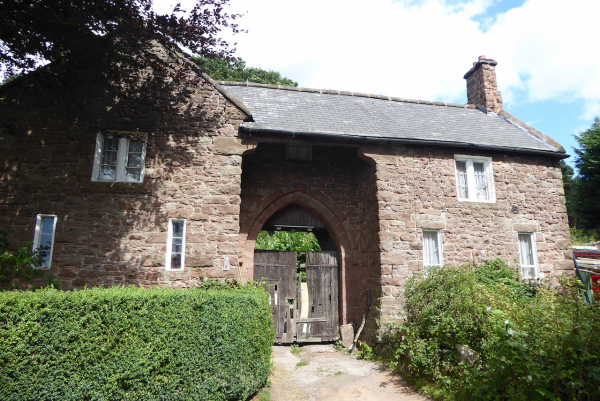 We pass the steps we took earlier going up Bulkeley Hill, and then reach the fine Peckerton Gap Lodge formerly the old gatehouse to the carriage drive to Peckforton Castle. 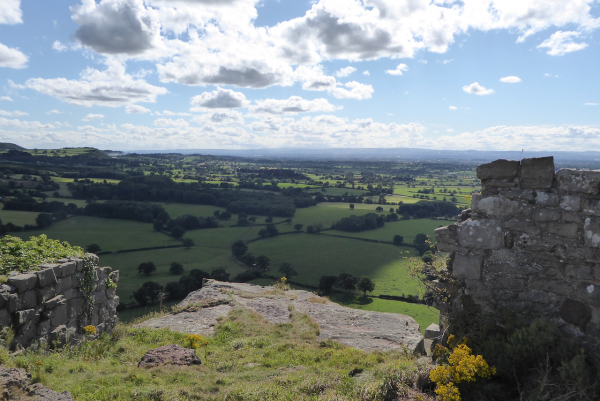 Our route is very straightforward; retracing our steps along the Sandstone Trail to Beeston Castle. Walking in this direction we get fine views of the castle as we cross the fields. After a refreshing cup of tea at the English Heritage tea hut we head into the Castle for a look around. 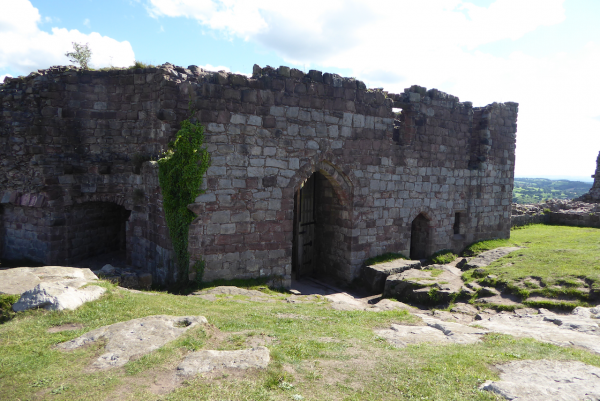 Ranulf de Blondeville, 6th Earl of Chester, built the castle in the 1220’s. Henry III seized ownership in 1237 and it remained a royal castle for more than four hundred years. 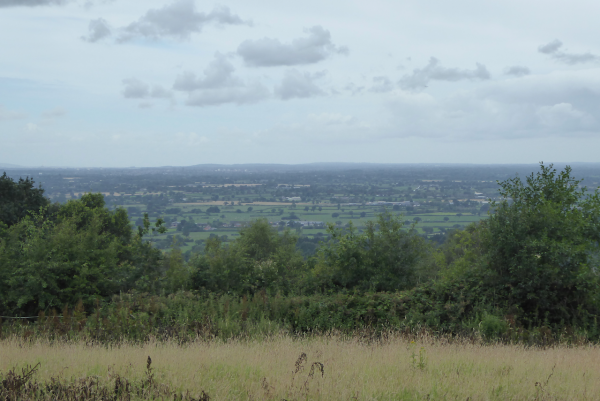 It was laid siege during the English Civil War before the Royalists surrendered it. It was partially demolished in 1646 to prevent it being used in the future. It’s location is amazing and it is hard to envisage how anyone could mount a successful attack, but equally it must have been very vulnerable to being besieged. 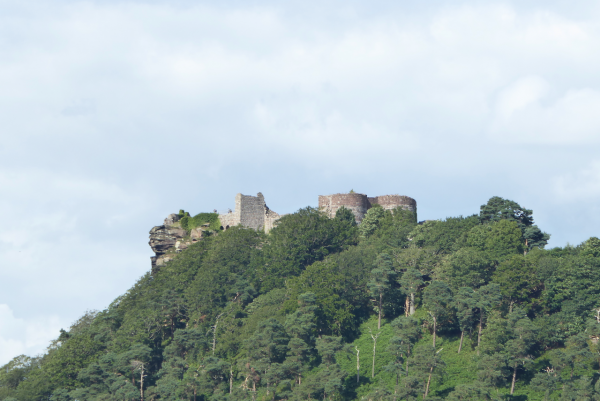 We wander around the castle and the grounds enjoying the history and the views. It is a wonderful spot to be on such a cracking day and English Heritage has done a great job in maintaining the site. Earlier I had hinted of an opportunity to sample a Snugsbury Ice Cream; fortunately we get there just before they are closing. 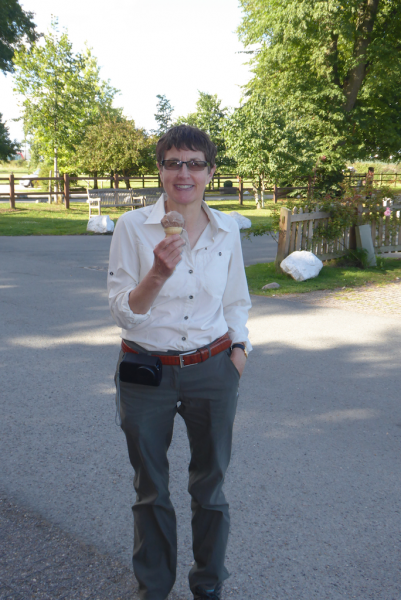 Blog readers will know that Lynnie has a liking for quality ice cream. Apparently this is one of the best she has tasted. Back at Swanley House CL whilst Lynnie checks out Snugbury’s website to establish a wish list of flavours to sample over the next few days, I research the Sandstone Trail, I probably should have done this before we set off today! The drop at Raw Head is around four hundred feet and I have a very sleepless night recalling this section of the walk. One thing is for sure I will not venture there again! Our walk today covered just over nine miles and it will live in the memory for a long time!